I am from a very nautical family from The Netherlands. My great-grandfather started a dredging company in Holland, my grandfather perfected the bucket-dredger, and my father ran the family shipyard "Vahali" on the river Rhine. I was practically born aboard my parents’ yacht 54 years ago (I was born in a hospital but my parents lived aboard because their house wasn't ready I understand). I learned sailing from my deceased father Jan, a great, perfectionist, yachtsman and shipbuilder. My mother Leonora van Hasselt-Graafland, almost 80, lives aboard the 75ft converted coastal vessel "Nora" in Enkhuizen The Netherlands. 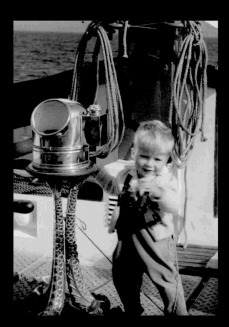 From rigging my brother’s diapers to a bamboo mast for the family yacht’s dingy some 46 years ago to giving sailing lessons in classical Dutch yachts I went on to skipper my father’s 45ft replica of a Bristol Channel Cutter mainly in Scandinavia. Working life started and I owned a series of smaller boats: a Hobie cat in Paraguay, a Dart in Portugal and a Marieholm 24 in Spain. Last year we landed in Houston and around Christmas we had finally saved the cash and spotted our ideal yacht a Bristol 40. 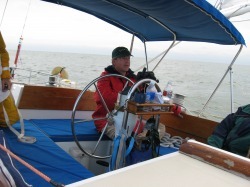 We became member of the venerable Houston Yacht Club and moored the yacht in slip 68 of the yacht harbor in La Porte Texas: 45 minutes from our home and right on Galveston Bay a very large about 12ft deep body of water between Houston and Galveston. We just got through most of the maintenance list and were longing for the hurricane season (and the very hot weather) to end to go sailing again. We were mentally preparing for the Harvest Moon Race in October; a yearly race from Galveston to Corpus Christi. And then Hurricane "Ike" hit Galveston bay head on. This never was supposed to happen. But it did with "Ike" the hurricane that fully hit Galveston Bay in the night of Friday September 12, 2008. 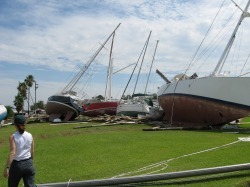 This is the lawn of the Houston Yacht Club on Monday. Sad, but as many people lost their homes glad that we didn't have to face worse. My article in Cruising World gives more details. Our Bristol 40 was eventually declared total loss in spite of the hopes we had to repair and be back sailing. In 2010 we have acquired an Alberg 37. This link connects to Joan III. Not having your own yacht anymore opens up the opportunity to sail on other people's yachts. Here a series of pictures and comments on the Harvest Moon Race 2008 where I crewed on Freedom's Wing under skipper owner James Steuwe. Follow the link to the Harvest Moon Race Pages: Before the start, Start, Finish Challenge, Port Aransas and Comments by Skipper and Crew.